Kenny signed from Forfar Athletic. He had little time to prove himself before the arrival of Finn Dossing effectively ensured that Kenny would play in the reserves. He was transferred to Queen of the South in the early part of season 1965-66. With only a solitary win after eleven league games. United were really struggling when the Fifers visited Tannadice. The home men had been having serious difficulties in finding the net and in an effort to solve the problem Stewart Fraser was moved into attack. 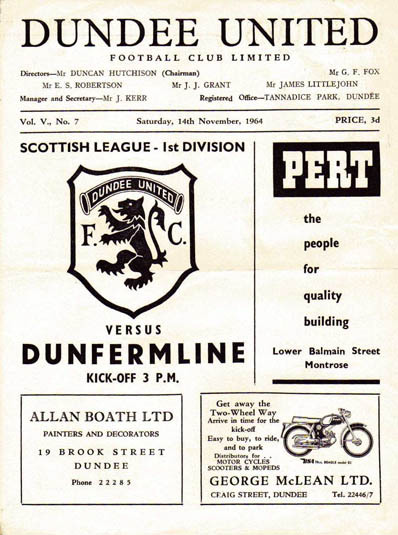 And how it paid off as the Aberdonian proved to be the scourge of Dunfermline with two fine goals. He took only seven minutes to get off the mark when he hammered home a Graham cutback past Herriot. United were put through the mill after the interval as Dunfermline went after that equaliser, but it was United who did the damage again when Stewart Fraser followed up a blocked free-kick to ram home his side's second. The game was played in deplorable conditions the result at least gave the home fans something to warm up about.